The past has not changed since the creation of the series A Hundred Years Ago in 2003. The present did. Due to new image technologies there are now more silent films available than ever. YouTube is full of them, and some archives make parts of their collections accessible online. In its first years, our section presented films impossible to see elsewhere; in 2017 most films will be presented as films, in the original 35mm format very difficult to see today. In the catalogue, the films are organized into four thematic chapters. They do not correspond to the order of projection during the days of the festival. As side dishes to the features, you will find a generous amount of short films. There is no serial scheduled this year, but – high time – some choice animation films. We hope to be able to develop a representative animation program in future editions. Several films from 1917 are to be found in other sections – Lucciola with the silent films of Augusto Genina, Caligula with the Rediscovered and Restored and Mater dolorosa by Abel Gance in the section Colette and the Movies. Moreover, sections are connected by links, so you can follow Mozžuchin from 1917 (Kulisy ėkrana) to 1923 and to 1926 (Kean and Casanova) or see two works that Frank Borzage directed in different periods. The Italian futurists did not make it into the programme – there is nothing worthwhile in Thaïs except the art direction of Prampolini in the finale. Nor did another film, unknown, very minor, but with a promising title and fabulous production credits: Beloved Vampyre (USA, 1917), a Knickerbocker Star Feature directed by Horkheimer. 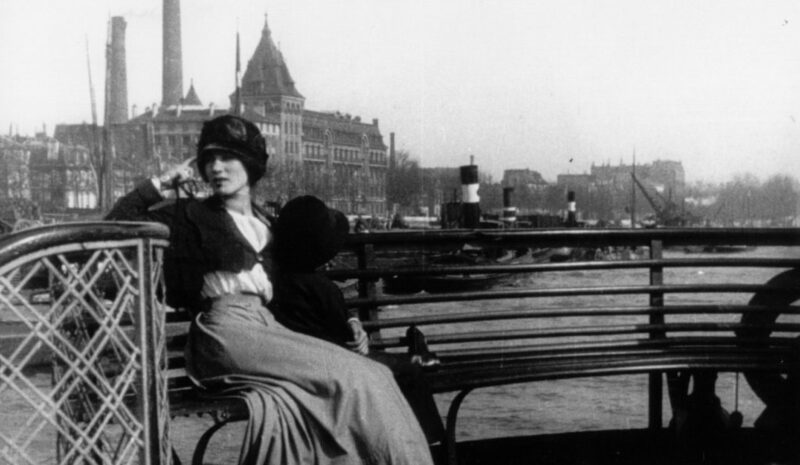 Despite there being more than 2000 films from 1917 to choose from, the vast majority were produced in the well-established film nations of that time. Tragically, almost all of the titles from countries outside of Europe and the USA simply did not survive. We did manage to unearth some exceptions for this year’s show. A superb long feature from Mexico called Tepeyac managed to survive a century of humidity, as did Lanka Dahan, a fragment from India. And we will also present a pioneering animated film from Japan called Namakura Gatana. Equally off the beaten track this year is part of our European selection: Az obsitos from Hungary, Bestia from Poland and some Russian films (see below) we provide rare images from the East. Another focus this year is on German cinema. The blanket ban on French movies in the Fatherland gave German production companies a chance to profit from the wartime media famine. Admittedly, a lot of the output was propaganda which is fascinating as a side dish. But it also seems that this was the moment when Germany became one of the major powers in silent movie production. December 1917 was when the giant Universum Film AG (UFA) studio was born. And one could also argue that many of the acclaimed stylistic elements which are emblematic of the German cinema of the 1920s actually originated in this strange time of war. Perhaps you’ll agree when you watch our two excellent feature films, Die schwarze Loo (Max Mack) and Furcht (Robert Wiene). Maybe German Expressionism wasn’t born in 1919-20 with The Cabinet of Dr. Caligari; and maybe aesthetic revolution is more of a meandering and long-winded affair. We’d actually say the same thing about real revolutions, too. For sure, 1917 is etched in popular imagination as the year of the Russian Revolution. But few people now recall that there were actually two Russian revolutions in that one year, and that these revolutions were the culmination of political protest and civic strife stretching back decades. These developments are discussed in two Russian films this year: Revoljucioner by Evgenij Bauėr and Ne nado krovi! by Jakov Protazanov. They both originate from that tiny, light-filled window after the Tsars’ time had ended and before the Bolsheviks took control and began the process of aggressively rewriting history to glorify themselves.